I looked out over the Wisconsin lake. I’d been on the road touring almost two weeks, my batteries were running low, but in the best way. She asked me about when I came out. I thought about it casually, “Well, its been four years…” I stopped, “wait… six… no, I mean five…” I thought about what day it was and wondered where I’d been. February had come and gone, along with a date I thought I’d never forget. February 17th, my “transiversary” as I like to call it. The day I officially mark my coming out, even though by that time I’d been “working” on things for months, years. I use February 17th as the marker because of my state of mind then and what I was working out. Back then I dedicatedly kept a journal. Every year I look back, and every year I see different things. Its like watching a movie over and over, you always catch some new thing you hadn’t noticed before. Every year I look back and whatever relates to my life at that time is what stands out. Last year was all about love and gratitude; reflecting on my history through realizations and gradual empowerment. This year, I am influenced especially by the fact that I forgot my Transiversary; I knew it was coming up but so much was going on with tour planning, documentary filming, performances, show production, drag practices, conferences… It just slipped passed me. I wondered at how it happened. Maybe I’ve finally reached a place in life where the absolute fact that I’m TRANS isn’t as prominent as it used to be, like I’m used to it now… Maybe I just haven’t kept an eye on myself as well as I should. This year has been amazing for me. I’ve been working non-stop; I’ve been on the road, enveloped in being an activist and a performer in ways I’ve never been able to do before. And I’ve been surrounded by the outside world more frequently and more intensely that I’ve ever experienced. To me, the “real world” means bouncing up, down, and around gender. What bathroom I’m in, what pronoun I’m called, flashing IDs, sirs to mams, mams to sirs – all rapid fire from airport, to gas station, to train car, to university, to theater, and back. I play ‘woman’ when I think its safest, I play ‘man’ when I think I can get away with it, and in between I’m just me; your average, flaming genderqueer femme transguy, genderfucked from head to toe. January 27th, 2006: I wrote about coming out to my sister as “Bi-sexual.” I have no idea why I spelled it like that (or capitalized it). Maybe it was from quasi-reading outdated text books and off the path internet forums. Shows how foreign it all was to me… guess being in that GSA in high school didn’t really prepare me for anything. 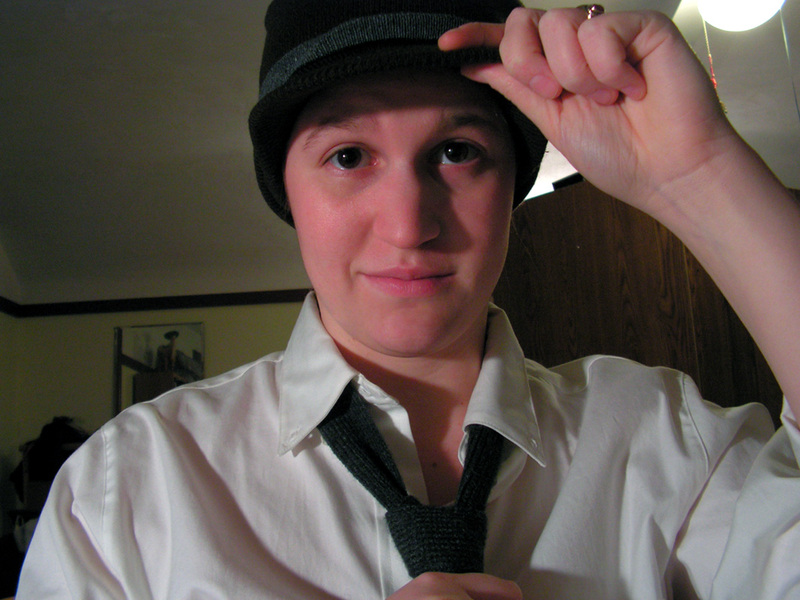 Taken February 14th, 2006: The first picture I took of myself in men’s clothes after starting to come out. I didn’t own a tie, so I used a belt from a sweater jacket. By February 17th, 2006, the day I now use to mark my Transiversary, I had started to use the word queer in my regular vocabulary. By March I had started to use the men’s bathroom, had passed as male three times, and had fully gained a new “queer” lexicon. I have to laugh and think its kinda cute how I sorted out the labels. “i’ve got a new description for myself. I’ve been reading up on it for a while. Like, what am I? “This life.” I keep going back to February 17th as some anchor for “this life” but really, I think that (though I had reasons) I picked that date to give myself a reference point for where I came from. Now, I think I’ve been cutting myself up. Lots of big moments have happened in my life in reference to my gender identity; New Years Eve 2005 when I was dolled up femme but “acted and felt like a boy” all night; six months before that I was dressing “as a guy” at home, and dressing “like a girl” in public; six months before that in the confidence of a close friend I “was a guy for a day”; six years before that I was signing notes with my “boy name” and secretly wished to be my best friend’s boyfriend; six years before that I begged my parents to cut my hair short like a boy. Which matters more? The day I said, “I am different that I thought.” or when I said “I know what this is.” or when I said “I accept who I am.” All of it had to happen, all of it mattered, and all of it got me to where I am now. Witness, I am officially limiting the Transiversary status as a marker date for ornamental purposes only. It will no longer represent a sectional “moment” of my life. Instead, like a birthday, it will be a representative of time passed, and times to come. I used to obsess over knowing myself, what I was, why I was that way, how I was going to handle it, and where I was going to end up. I’m starting to think that not knowing yourself is one of the few things that drives us towards tomorrow. Every time I think I’ve got myself figured out, something new arises. Its not a bad thing. The day I stop learning about who I am and working on who I want to be, I’ll be dead. I used to think time was a factory, producing life bit by bit. Now, I’ve come to know that time is more like the earth, holding us beneath our feet, surrounding us with all that comes from it, and passing over us like the sky hanging over head. We move under it, within it, and over top of it, no sense of control, and no way to be controlled. I think that in this year of being out in the world, I’ve been hiding more than ever before. I’ve been hiding more because unlike the past, I know who and what I am. I know what I want to be, how I want to be seen and treated, and I know I have the right to have it. Still I’ve been hiding; out of fear, out of convenience, out of remorse for being different. I’m not going to try to cut up my life any more and I’m not going to cut up myself either. Whatever that means for bathrooms, I don’t know. The women’s room is still gonna be cleaner, and it’s still gonna be safer. But maybe I need to start pushing the buttons I haven’t wanted to push since I was a high-strung, newly out transguy refusing to take anything less than a “he/him” pronoun and a men’s bathroom… who am I kidding, even at my most militant I was never very aggressive when it came to standing up for myself. I’ve always been better at defending others, so its what I’ve always done and I’ve counted on catching that overflow into my own life. It’s pretty clear what I need to do about that… I need to take ownership over myself and truly recognize that I’m not just a cog in the machine of this movement; I’m a human being within this community. Five years ago I wrote that this life was a dream, a gift. I still think that, and for the same reasons. It’s the people in life that make it worth living, and while I don’t think I am “living for some else” I don’t think I am living my life just for me. The better I can live my life, the better I can work to make other people’s lives better too. I’m not counting on ever getting a PhD, (no matter how happy it would make my mom). I don’t think I’ll have much luck on discovering a new solar system or obtaining the presidency – first woman or otherwise, but I’ve got the first two down, and I’ll be working hard on the last two for the rest of my life. This was really excellent to read. I relate to the process with labels. Thank you for your advice via email. I have started on the process and still find a lot of comfort in the words of other people coming from similar places. Glad you are coming to Transpride in Pittsburgh. I will have to say hi in person instead of being the chicken I have been. That last part was really cute. Reminds me of my little self. You’re lucky to still have notes from when you were 11. Glad to see that you’re kickin’ it well with music and art! Life really is precious, and though it can be annoying I still love living too. I hope you would come to Seattle some time if you can to preform here. We’d luv u. Even *I* remembered your Transiversary lol (I promise i’m not a stalker…you just mentioned that it was coming up when we talked on the phone that one time and I remember goofy things like that). I almost sent you a text wishing you a good one but I thought you might think I was weird, as if everyone didn’t already know i’m a hot mess. But your writing always has a way of making me think about things in a different way, and pretty much invariably i’ll sit there and just think about things for a long long time….or go play music. Same difference, really. Either way, you really help me through things. So I guess I just wanted to thank you for posting this :)I hope everything’s going well. jac, this was so moving. thank you so much for sharing. “I’m starting to think that not knowing yourself is one of the few things that drives us towards tomorrow”– that is pretty much how i have been feeling about life for the past 6 years (ever since hurricane katrina and the federal flood). i thought 6 years ago that i had plans and steps and that i and all my plans fit into a easily-read map. i wanted it that way. in some ways, i could not be more grateful for the tragedy because it forced me to look deep within and actually think about how i was and who i wanted to be. and then, somehow, as one clear identity rose to the surface, new orleanian, others started to become unstable. and it actually felt liberating. i don’t feel like i know myself well at all and i think that’s good– because i am constantly on that quest to know myself better. and when things change and surprise me, i can roll with it, including changes in myself or my identities. “The better I can live my life, the better I can work to make other people’s lives better too”– also pretty much sums up what it’s all about. being kind and respecting and giving to yourself is the only way you can really do the same for others. i think so many of us who are working to try to make the world a better place can really get bitter and jaded and not treat ourselves well. and then what good are we to anyone? i also wanted to go into space, but i definitely never wanted to be president! Bree – thank you. i can’t find any better words than that.